This oil on canvas painting is titled "Les Elephants". 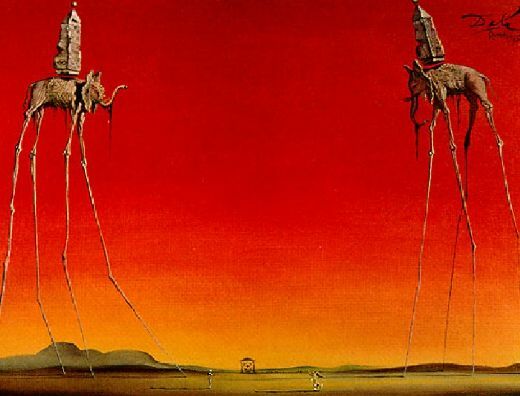 It was created by Surrealist Salvador Dali (1904-1989) in 1948. 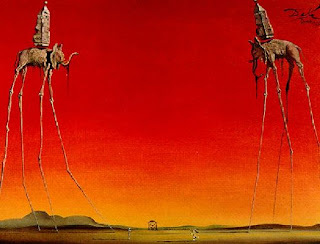 Dali is known for including symbolism in his painting; elephants being one example. The spider-like legs of the elephants give the elephants' body a sense of weightlessness. I looked up this painting out of curiosity because my friend recently got a tattoo across his ribs of the Dali elephants. I really like the orange, red, and yellow colors of the background. It looks like a sunset you would see in Africa, where elephants are usually found. "Pollard Willows With Setting Sun"